Blast off on an exciting around-the-world adventure with LEGO World Racers. Featuring high-flying helicopter toys, super-fast boats, motorcycle toys and race cars – with LEGO World Racers your journey knows no bounds. All you have to do is choose your ride and set up your course. Will you go on a high-octane jungle race? Will your teams face off on a duel in the desert? Or will your toy helicopters race to the finish line in the sky? It’s all up to you to decide. This is a BRAND NEW, HARD TO FIND AND DISCONTINUED set of LEGO World Racers 8863 Blizzard__s Peak from 2010. This set is still factory sealed and the box is in very good condition with minor shelf wear. 504 pieces, 5 Minifigures_? This is a BRAND NEW set of LEGO World Racers 8899 Gator Swamp from 2010. This set is still factory sealed and the box is in very good condition with minor shelf wear. 354 pieces, 5 Minifigures_? This is a BRAND NEW set of LEGO World Racers 8864 Desert of Destruction from 2010. This set is still factory sealed and the box is in very good condition with minor shelf wear. 961 pieces, 8 Minifigures_? 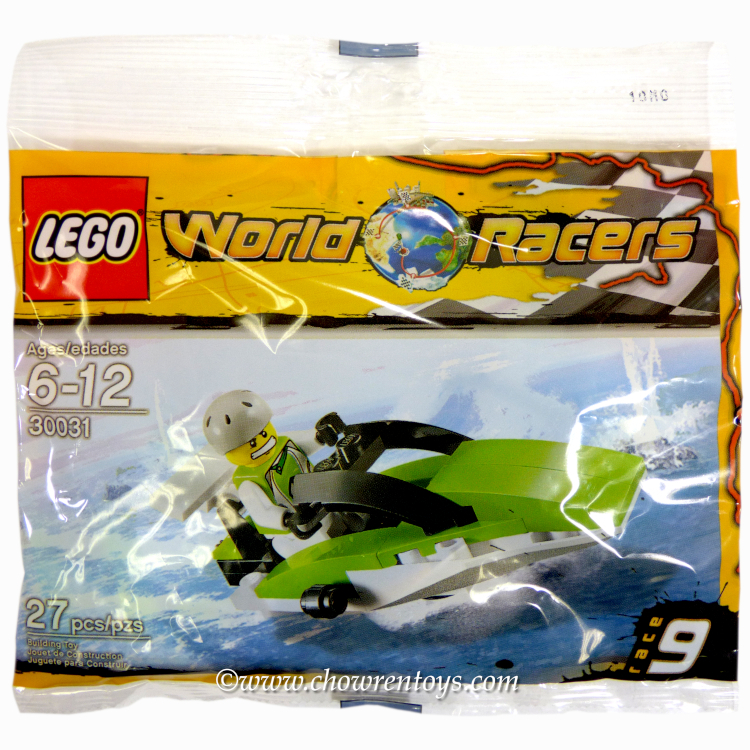 This is a BRAND NEW polybag set of LEGO® World Racers 30031 World Race Powerboat from 2010. This polybag set is still factory sealed and is in very good condition. 27 pieces and 1 minifigure©. This is a BRAND NEW polybag set of LEGO® World Racers 30032 World Race Buggy from 2010. This polybag is still factory sealed and is in very good condition with minor shelf wear. 35 pieces and 1 minifigure©.